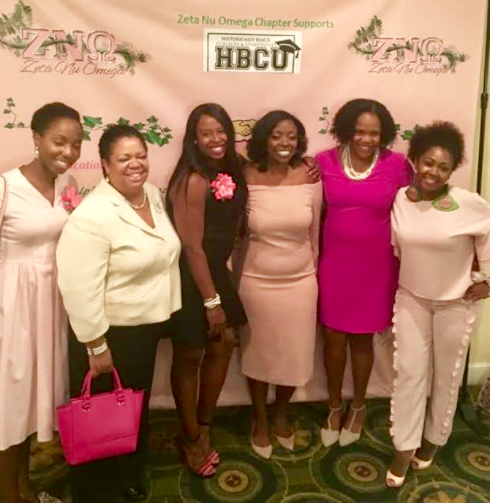 The Ladies of Alpha Kappa Alpha Sorority Inc., Zeta Nu Omega Chapter hosted its 57th Annual Fundraiser benefiting the ZNO Community Service Fund Inc., at the Westchester Marriott in Tarrytown, NY with more than 520 attendees on September 16. This lively event celebrated excellence in Historically Black Colleges and Universities (HBCU) with prominent honorees Erika Kennerly, Esq. of Google, the Mount Vernon and New Rochelle Chapters of My Brother's Keeper, Zeta Nu Omega Chapter member Dr. Donna J. Thomas, and Mrs. Carrean T. Williams, an 82-year member of Alpha Kappa Alpha Sorority, Inc. who was recognized posthumously. Greetings were extended by Alpha Kappa Alpha Sorority, Inc. North Atlantic Regional Director Meredith L. Henderson, and Spelman College graduate Regina F. Graham served as Mistress of Ceremonies. Entertainment was provided by Sherry Winston and "The Legendary" Chris Washington of Howard University, and many attendees were HBCU alumni. The Luncheon, which featured giveaways from Marriott, JetBlue Airlines and Azul Brazilian Airlines, raised more than $52,000 for the chapter's scholarship and community service initiatives. Ms. Lynda Bagley, President of the Zeta Nu Omega Chapter and an alumnus of Florida A&M University, said: "Zeta Nu Omega Chapter is proud to embrace the Alpha Kappa Alpha 'Think HBCU' international Initiative while continuing our local tradition of providing financial support to Westchester County high school students. “Throughout the years, we have raised and granted more than $625,000 in scholarships and this year Zeta Nu Omega will award an additional $17,000 in scholarships to the graduating class of 2017. “This Annual Fundraiser also provides the opportunity for Zeta Nu Omega to recognize community partners and corporate sponsors Colgate Bright Smiles, Bright Futures and Amazon.com. Their support allows the organization to continue and expand their community service footprint." Serving as Co-Chairmen of the Alpha Kappa Alpha Sorority Inc., Zeta Nu Omega 57th Annual Fundraiser were Dr. Rhonda G. Jones, an alumnus of Howard University and Dr. Karen Williams who is a proud Lincoln University mom.